Daniel Wilson's Blog: Science Bomb! On Friday Chris Spencer gave the PPS (Pritchard/Przeworski/Stephens) lab meeting as part of a trip to Chicago. Chris talked about his work in Oxford on association studies in a number of common genetic diseases being studied by the Wellcome Trust Case Control Consortium. Beforehand I dropped the Science Bomb, a new innovation this year (for which I think Barbara Engelhardt is responsible) where someone talks about a particularly interesting or timely article. Dan Gaffney pointed me in the direction of a PLoS Biology paper titled Reawakening Retrocyclins: Ancestral Human Defensins Active Against HIV-1. The subject of the study is a human pseudogene known as retrocyclin, which has been shown to confer resistance to HIV-1 infection in human cell lines. The pseudogene is expressed naturally in several human tissues, but not translated into protein owing to a premature stop codon. 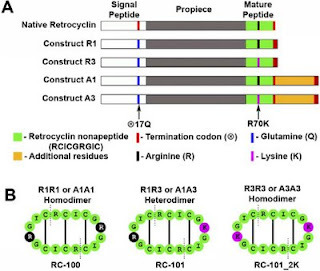 The paper's authors reawakened retrocyclin using aminoglycosides, a class of antibiotics that cause (as a side effect) a degree of mis-translation and hence allow "read-through" of the stop codon. You can see the slides from my Science Bomb here. This is a great chance offered students to learn more about the antibiotic knowledge and other interesting things in this field.